Tickets: Buy Now or call or 337-265-2100. History: Since 1985, the University of Louisiana and its perennial powerhouse softball program has called Alfred and Helen Lamson Park its very own home. Often called the most beautiful and nostalgic field in the country by opposing teams who play on it, Lamson Park went through a $2.1 million renovation from 2009-11. The renovation included a new mostly-covered grandstand between dugouts, three private luxury boxes and a 50-seat Stadium Club. There was also the addition of more seating beyond the outfield fence. All of these new seats bring the capacity of Lamson Park up to 2,790. Also included in the renovations was a new press box with three broadcast booths, a larger and more functional locker room that includes a technology-driven meeting room and new scoreboard in right field that debuted in 2010. Originally known as Lady Cajun Park, the facility changed names in 2002 to Ragin' Cajuns Softball Park. In 2006, the name was changed again to Alfred and Helen Lamson Park. The facility was dedicated in memory of long-time loyal supporters Alfred and Helen Lamson. Even today, the facility continues to grow to meet the needs of an ever-growing fan base and provide a first-class atmosphere. In 2007, the UL Athletics Department oversaw the construction of the Leon Moncla Indoor Practice Facility. Equipped with an artificial playing surface and drop-down batting cages, it is located adjacent to the softball field. A few other changes were made in 2006. The right field and left field foul lines were adorned by brick walls. Another major construction project involved new dugouts for both the Cajuns and the visiting team – adding to the new and improved look of the facility and providing the biggest square footage dugouts you will find in the country. The batting cages down the right field line were expanded in 2006. The new design allowed the Ragin’ Cajuns access to six different cages at once and was able to accommodate several teams at once when Louisiana hosted a tournament. If there really is a "Field of Dreams," it might just be UL’s Lamson Park. Thirty years ago, the land which now houses the facility, was a pasture filled with barns, cattle, six-foot tall grass and the University’s dairy farm. Today, this same land houses one of the best facilities in the country and plays host to the greatest softball show around. The evolution of Lamson Park has been ongoing ever since it was constructed in the 1980’s. Starting in the early 1990’s the facility began to grow into its current state. After sustaining damage during Hurricane Andrew in 1992, a 30-foot backstop and a grandstand seating section were added behind home plate. Not long after, a Press Box/Concession was added on to the grandstand. The Cajuns received a welcome addition to Lamson Park at the end of the 1994 season. With the generosity and effort of many loyal fans, the Cajuns received a locker room/bathroom facility with brand new carpeting and a satellite television, as well as leather furniture – giving the team plenty of room for relaxation before and after the game. An equipment room with a washer and dryer was also part of the facility. Lamson Park had a 225-foot fence encircling the entire field until the 1995 season. NCAA regulations called for an adjustment of the fence so that all possible Regional sites could be uniform. The fence now reaches 200-feet down the lines and 220-feet in centerfield. In 2002, a new lighting system was installed allowing Lamson Park to meet the NCAA lighting standards for hosting an NCAA Regional, an amenity in which few facilities across the country compare to. 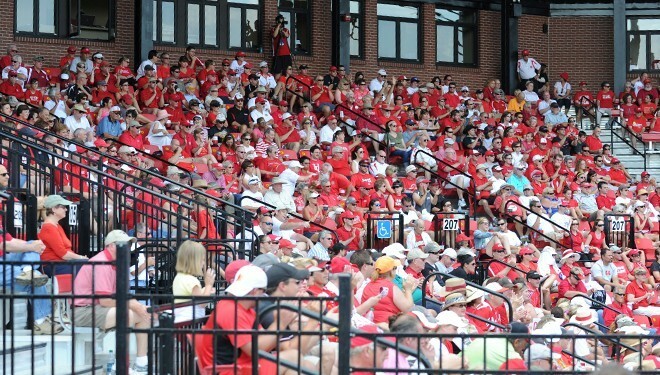 The all-time Lamson Park attendance high occurred on May 20, 2012 in the Lafayette Regional Championship game vs. Stanford when 2,729 packed the park to see the Cajun win their seventh regional title with a 6-2 win over the Cardinal. The previous attendance record came on April 18, 2001, when 1,729 managed to pack into the facility as Louisiana hosted in-state rival LSU in a doubleheader. The two nationally-ranked programs split the doubleheader, as fans lined the fences for the Louisiana intercollegiate softball attendance record. Lamson Park has hosted one NCAA Super Regional (2014), 10 NCAA Regionals (last was 2014), and the 2000, 2004, 2011 and 2014 Sun Belt Conference tournaments. From Baton Rouge, LA: Lafayette, Louisiana is located 65 miles southwest of Baton Rouge (68 miles from the airport). By automobile the trip will take approximately 1 hour. Below are directions to assist you in your travel. Take I-10 West out of Baton Rouge and travel 55 miles and exit the interstate at exit # 100 and turn left. Then follow Ambassador Caffrey Parkway into Lafayette. From New Orleans, LA (via I-10): Lafayette, Louisiana is located 137 miles west of New Orleans (128 miles from the airport). By automobile the trip will take approximately 2.2 hours. Below are directions to assist you in your travel. Take I-10 West out of New Orleans and travel 134 miles and exit the interstate at exit # 100 and turn left. Then follow Ambassador Caffrey Parkway into Lafayette. From New Orleans, LA (via US 90): Lafayette, Louisiana is located 137 miles west of New Orleans. By automobile the trip will take approximately 2.2 hours. Below are directions to assist you in your travel. Take I-10 West out of New Orleans and exit the interstate at exit 220 and merge onto Louisiana Highway 310 South and travel 12 miles before exiting onto US Highway 90 West towards Houma. Travel 124 miles and turn left onto University Ave. Travel one mile to downtown Lafayette and the University Campus. From Houston, TX: Lafayette, Louisiana is located 215 miles east of Houston (225 miles from the airport). By automobile the trip will take approximately 3.3 hours. Below are directions to assist you in your travel. Take I-10 East out of New Orleans and travel 205 - 215 miles and exit the interstate at exit # 100 and turn right. Then follow Ambassador Caffrey Parkway into Lafayette. From Shreveport, LA: Lafayette, Louisiana is located 215 miles southeast of Shreveport. By automobile the trip will take approximately 3 hours. Below are directions to assist you in your travel. Take I-49 South out of Shreveport and travel 207 miles and take exit 1B onto I-10 West towards Lake Charles. Travel approximately 3 miles and exit the interstate at exit # 100 and turn left. Then follow Ambassador Caffrey Parkway into Lafayette.